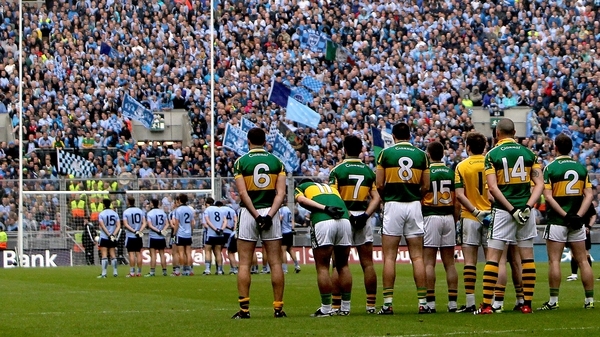 A strong first half proved far more than half the battle for determined Dublin who braved the difficult Croke Park conditions to hold on for a third All-Ireland title success in five seasons, their second at Kerry's expense in that period, as they prevailed by 0-12 to 0-09. Jim Gavin's side built up a four-point half-time lead after a strong finish to the opening half when they outscored holders Kerry by six points to one. It afforded the Sky Blues a cushion that they relied upon throughout an error-strewn game that they ultimately deserved to win and, in truth, could have won by significantly more. Dean Rock, Brian Fenton and Paddy Andrews all failed to capitalise on great goal chances, though Kerry were unable to punish the capital county. 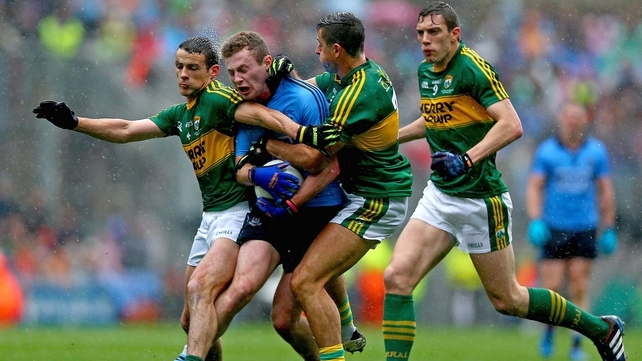 Kerry were guilty of wasting their own great goal chance late on and it was a pivotal moment that the game turned on. Substitute Kieran Donaghy fed Killian Young but the defender fumbled his catch close to goal, allowing Dublin to regroup and block the goal threat. There were three points in it at that stage and from the next attack Dublin substitute Alan Brogan kicked a point that proved to be their insurance score. Kerry rallied late on and Donaghy did his best under the high ball to pinch a crucial goal, but the best they could muster in the closing stages was a converted free from Bryan Sheehan. 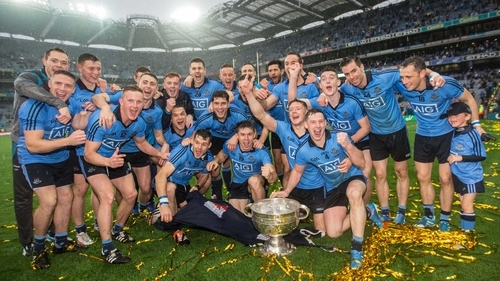 Dublin would have been terribly unfortunate not to hang on for a victory that keeps their curious trend of All-Ireland titles every second year intact. The five-in-a-row Leinster champions and three-in-a-row league winners were attack-minded from the off and opened up a two-point lead. But conditions conspired against a quality game and with 20 minutes on the clock it was poised at 0-03 to 0-03. That's when Dublin found their best form in the entire game and took over with a series of scores, including points from defenders Jack McCaffrey and Philly McMahon. Paddy Andrews boomed over a beauty too after shrugging off Fionn Fitzgerald. Dublin deserved their 0-08 to 0-04 double-scores advantage and made a number of substitutions to try and keep themselves in pole position. Kevin McManamon, Kerry's destroyer in the 2011 and 2013 championship encounters, came on at half-time and Michael Darragh Macauley was introduced soon after. Kerry brought on their own stars in the shape of Darran O'Sullivan and Paul Galvin, and O'Sullivan contributed two important points. But the closest they got to Dublin was two points as the favourites continued to keep their noses in front with timely points. Paul Flynn's two points were important for Dublin in the second half, while sub Alan Brogan closed out their scoring in the 67th minute with a point that could prove to be his last for Dublin if the 33-year-old now chooses to bow out at the top.